Minnesota Congresswoman Betty McCallum is not very happy. She’s also not very honest. St. Paul, MN — Congresswoman Betty McCollum honors and respects the Pledge of Allegiance and believes the United States is one Nation under God. She has led the Pledge of Allegiance on the floor of the U.S. House of Representatives numerous times as can be seen in these video links. Conservatives are using an eight year old video clip to incite hate, racism, and intolerance among Tea Party Republicans. This right-wing effort to call into question Congresswoman McCollum’s Christian faith, her belief in God, and her patriotism is blatantly anti-American and all too similar to the extremists who earlier this year mailed a soiled American flag to her Congressional office and threatened the Congresswoman with violence. Congresswoman McCollum rejects this radical agenda and condemns the extremist tactics behind this poisonous political exploitation of the Pledge of Allegiance. (1) She took a breath. (2) She intentionally omitted the words “under God.” (3) She doesn’t know the words to the Pledge. We think it’s probably number three, since she also incorrectly inserted the word “the” in front of “allegiance” at the beginning of Pledge. And the third possibility is probably the worst of the three. It’s been several weeks since Al Gore was in the news and he must have read about James Cameron’s global warming hypocrisy and felt jealous. "I think I'm getting a canker sore," Gore said. "They're caused by global warming, you know." 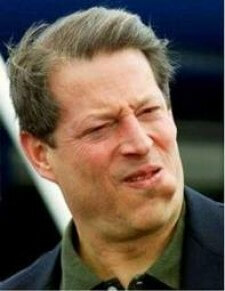 Ahhhh, but if you thought Gore’s global warming hypocrisy was done for the day, you’d be wrong. He was just getting warmed up, so to speak. After the ceremony in the Norwegian capital Oslo, it is customary that the laureate is invited to the Swedish capital Stockholm, for a cordial visit. 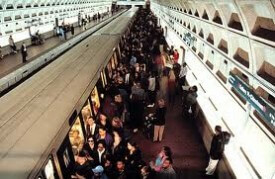 The train ride, supposedly the environmental choice according to Mr. Gore, is approximately four hours. However, he opted for the cosier ride with one of the Swedish government aircrafts. As these can, according to the rules, only be used when a cabinet member is on board – and as the Swedish government after a short ceremonial visit – offered to fly him to Frankfurt (Germany) for his flight to the US, you can calculate both the manpower and the fuel used for this grand tour against man’s destruction of the planet. Take that, James Cameron. Al Gore is still the king of global warming hypocrisy. If someone wanted to bet that Al Franklin was the craziest politician from the Land of 10,000 Lakes we would have called it a safe bet, but that was before we saw this intellectually and bias challenged individual. As difficult as it must be to be on the same show with Ed Schultz and yet state the most ridiculous person on the show, Rep Keith Ellison pulls it off. Please note that we do not consider Keith Ellison an extreme Muslim. Just a rather predicable and somewhat boring one. Much has been made about Barack Obama’s appearance on The Daily Show the other night. Especially the similarity of his “Larry Summers did a heck of a job” line to the “Brownie did a heck of a job” comment for which George Bush was excoriated. The Daily Show host was giving Obama a tough time about hiring the conventional and Clintonian Larry Summers as his top economic advisor. “You don’t want to use that phrase, dude,” Stewart recommended with a laugh. Dude? Has any president in history so cheapened the office that a comedian felt comfortable calling him dude? We love Teri Davis Newman. She’s been reading IHateTheMedia.com and leaving pithy comments since about day three. 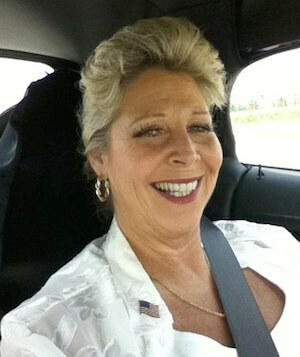 Teri’s the Republican nominee for Congress in Illinois-12. She’s running against fat-and-happy, 12-term incumbent Democrat Jerry Costello, who hasn’t had a real challenge in god knows how long. 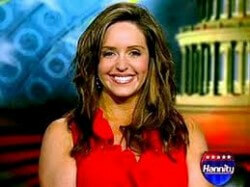 She’s smart, spunky, and not afraid to say what needs to be said even if it’s not the “smart” thing to say. For some unknown reason, she agreed to do IHateTheMedia.com’s first congressional candidate interview. As you might expect, her answers are better than our questions. 1. 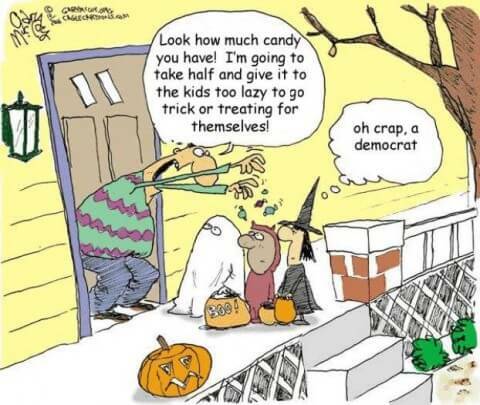 If you were a witch, would you be Glenda the Good Witch from the Wizard of Oz, Samantha from Bewitched or Nancy Pelosi? Nancy Pelosi isn’t qualified to be a witch. The only magic she’s ever performed is convincing the people of California-8 that she’s not a psychotic Botox-addicted knuckle-dragging vodka-swilling spotted owl-loving liberal. The rest of the country knows better. 2. On gay marriage, would you vote as a typical conservative and be against it, or would you be in favor of it because as a wedding planner it could increase your income? I’m not one to sell my integrity for money. 3. You can invite any three people – living or dead- to dinner. How do you split the bill and under whose name is the reservation made? I’ll make the reservation and pay the bill. They’re dead so it’s a cheap date. 4. Beatles or Stones? PC or Mac? Ninja or pirate? Hayak or Keynes? 5. Celebrated movie The Graduate is left famously unresolved. In your estimation what happened to characters Benjamin and Elaine after they departed from the bus? They get married, have 2.3 children. Subsequently they divorce and Elaine takes half of the money he made in “plastic.” Sadly, Benjamin is killed in a prison riot where he was doing time for insider trading. Obama to Dems: “we need you fired up”. Ya know, I say same thing to Dems in Congress all the time. Except without the “up” part. On a mostly unrelated note, we only need 11 characters to comment on Fred Thompson's wife Jeri: Va-va-voom! Another DADT ruling: yesterday, if you were in and you were out, you were in. Today, if you’re out and you’re in, you’re out. Iran says it now has twice as much enriched uranium as it did in June. So THAT’S where Obama’s policies created/saved jobs. Dem Rep Frank loans $200K to own campaign. Um… has anyone told Barney that if he loses, he doesn’t get a bailout? Reid: Obama “like the Chilean miners”. Why? Because Obama’s in over his head, or because he’s giving us the shaft? SCOTUS: jailed felons do NOT have right to vote. Dems should be worried. Next they might rule dead people can’t vote, either. Boeing to raise health plan prices b/c of Obamacare. I didn’t know Boeing paid so many of its workers over $250,000 a year. Whaaaaa. We thought the Democrats had already exhausted their supply of weak reasons they’re going to lose Tuesday’s election. But they’ve come up with a new one. In more bad news for Democrats, rain is in the forecast for much of the country on Election Day. Weather tracking websites, including weather.com and The Old Farmer’s Almanac, are calling for rain in the Midwest, Southeast, and Northeast regions, with chances for precipitation in other parts of the country as well. Nonsense. Of course, Democrats are capable of voting in the rain. 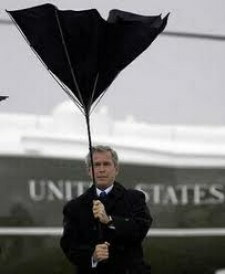 But sometimes, when it gets really wet, they only vote once. 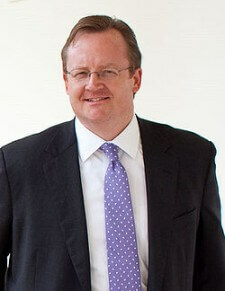 Robert Gibbs seemed shocked by this comment, despite the fact that we can’t recall any party ever hoping that its opposition would win re-election. One can only conclude that the innocents at the White House are easily shocked. Now we’re shocked. This is the first time we’ve ever seen anyone other than Fox News note Gibbs’ annoying sarcasm. Oh, please, Bob. Do you mean like a certain young Illinois senator who got stuff done for the people of the United States by beginning his campaign for president the day he was elected to the Senate? Yes, of course, it's PhotoShop. But it's damn funny PhotoShop. To tell you the truth, we’re not all that interested in the “Don’t Ask, Don’t Tell” policy. But we ran across this photo on the internet a few weeks ago and we’ve been looking for an excuse to run it. But in case you care, the 9th U.S. Circuit Court of Appeals reinstated the controversial regulation on Wednesday. Government lawyers sought to suspend the ruling while appeals were pending, arguing that it would pose a major problem for the military. They said it could encourage service members to reveal their sexual orientation before the issue is fully decided. Seriously. The photo makes this whole story worthwhile, doesn’t it. Keep your fingers crossed. Maybe a recent caller to Al Sharpton’s radio show is a sign of things to come. Caller: Reverend Al, I’ve been following you since the eighties ever since Tawana Brawley. Brother, you’ve had a place in my heart that is special. But I’m from Chicago and the Democrats here can’t stand on their record, Reverend Al. That’s why the people are not coming out to vote, because they’ve been abused and misused. And I would just like to end with this that the Democratic Party has controlled the state government for at least ten or fifteen years. The Democratic Party has controlled Chicago for at least 50 years and the blacks in Chicago and the blacks in the State of Illinois are worse off here, Reverend Al. You should come to Chicago so that you can see how bad they treat the people and now you gonna ask the people that you’ve been beaten down smacked up for ten or fifteen years to vote for me? I’m not that ignorant, Reverend Al. I’m not going to keep expecting different results doing the same thing. Love you, brother. Out of here. Prepare yourself for one of the most hostile TV interviews you’ll ever see. No, please allow us to make a correction. This isn’t an interview, it’s an attack. Philadelphia TV anchor Jeff Cole can’t even hold off on his disdain for James O’Keefe long enough to introduce the young citizen-journalist. O’Keefe’s crime? Exposing the corruption in the New Jersey teacher’s union with another of his trademark undercover interviews. Pity CBS and the New York Times. They can see the Republican tidal wave coming, but their liberal bias is so strong that they can’t bring themselves to admit the size of what they see. With the midterm elections less than a week away, a new CBS News/New York Times poll finds that Republicans continue to hold an advantage over Democrats in the generic House ballot. Forty-six percent of likely voters say they plan to vote Republican, while 40 percent say they will vote Democrat. Americans are divided in their views of the job President Obama is doing: 45% approve, while 47% disapprove. This poll was conducted among a random sample of 1,173 adults nationwide, interviewed by telephone October 22-26, 2010. An oversample of African Americans was interviewed, for a total of 273 interviews with African Americans. What this means is that CBS and the New York Times have stacked the deck in this poll two different ways. And both of them lessen the impact of the aforementioned tidal wave. First, they oversampled blacks, who are not just predominantly Democrat, but overwhelmingly Democrat. Blacks are approximately 13% of the population, yet in this poll they account for 23% of the respondents. Obama’s not on the ballot and it is widely expected that black turn-out will decrease in this election, not increase. So what rationale could possibly justify oversampling by 77% (10/13) an ethnic group that voted 95% Democrat in the last election? Based on this, we assume somewhere around 170% of blacks will vote Democrat in this election. Of course, this will necessarily require a major “get out the vote” effort in cemeteries across the country, but those are traditional Democrat strongholds. Second, self-identified party breakdown (weighted) in this poll shows 28% Republicans, 38% Democrats and 45% Independents. Do CBS and the New York Times really think Democrats outnumber Republicans by 35% (10/28) in a year when Republicans are expected to dominate the balloting? For god’s sake, man, Obama only won by 7% in in 2008 in what was widely considered a runaway election. To show just how distorted these figures are, on the same day this CBS/New York Times poll was released, Gallup released a poll on the composition of likely 2010 voters. It shows 55% Republican/Lean Republican, 40% Democrat/Lean Democrat and 4% Independent. Of course, it’s always possible that Gallup oversampled racist, sexist, homophobic conservatives. But we doubt it. Good news! Now you can put part of the national debt on your credit card. How’d we miss this story back in June? In case you don’t think the government takes enough of your money, they’ve come up with a simple way for you to give them more. Got a few extra bucks for Uncle Sam? Now the U.S. Treasury has made it easier to donate—via credit card. In January, the department’s Bureau of the Public Debt began to accept payments via Visa, MasterCard, American Express, or Discover. May we suggest that you apply for a Platinum card. You’re going to need it, because last we heard your share of the national debt was $43,000. Wonder if Juan Williams ever flew on an airplane with this guy. Russ Feingold, Ralph Feinberg, Benny Kubelski. They’re all the same to Roland Burris. 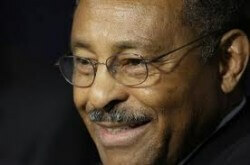 Roland Burris, the embarrassing Illinois Democrat appointed to fill out the remainder of Barack Obama’s term in the Senate, will quickly be forgotten. Oddly enough, his own memories of his time in the Senate seem to be fading already. The outgoing Illinois Democratic senator, in the course of an interview with the Chicago Tribune, mistakenly referred to his colleague Sen. Russ Feingold as “Ralph” and “Feinberg,” according to the Tribune’s profile. “We’ve had a great relationship,” Burris said. Feingold, a Democrat, was among the first to support Burris for the seat that used to belong to President Obama. Burris’ appointment generated controversy when ex-Gov. Rod Blagojevich named him under a cloud of ethics allegations. One can only hope that Burris’ memory lapse is a precursor to November 2 and that a lot of current Democrat names will soon be forgotten. Poor Katie Couric. She’s finally figured out why no one watches her nightly newscast. It’s not her fault. It’s not her network’s fault. It’s all the fault of those moronic Americans who don’t live in New York City. That’s why Couric has spent recent weeks in Chicago, Philadelphia, Boston and New Brunswick, New Jersey. She is touring what she calls “this great unwashed middle of the country” in an effort to divine the mood of the midterms. Therein lies a key reason why Couric has sometimes struggled in her current job. She’s always seemed constrained by the rigid, 22-minute format, a far cry from her freewheeling Today performances over a decade and a half. So she has devised ways to slip out of her $15 million-a-year prison—launching a Web show, engaging on Twitter, and getting out in the field. “The great unwashed” is a term coined by Edward George Bulwer-Lytton that refers to a lower order of schlubs who are looked down upon by most of society. You know, the common people. The stupid. The ones who don’t have minds of their own. We hate the media. We really do. But not as much, we suspect, as they hate us. Jimmy Carter and Hardball. Just reading those words is enough to let you know something odd is about to happen. We’re not even quite sure what that means, but since Carter is in the middle of his 30th Annual Carter Presidency Rehabilitation Tour, you knew he’d say something stupid. Once a liar, always a liar. Once Jerry Brown, always Jerry Brown. Former California Governor Jerry Brown admits – right after he left office – that he didn’t have a plan, lied about having plan, made the whole thing up, said the words and couldn’t believe it when the sheeple of California bought it hook, lie and sinker. What are the chances this misanthrope has a more realistic plan this time around? Speaking at fundraiser for in Manhattan on Tuesday, Joe Biden played a little fast and loose with history. But knowing Biden, he was just making crap up as he went along. The two railroads met at Promontory Point, Utah. Joe Biden was unable to attend. The fact that every word Biden said is either oversimplified, misleading or incorrect tends to weaken his argument about the importance of government intervention. But this is, after all, Joe Biden, so let’s not let the truth interfere with a good story. Fact is, the transcontinental railroad wasn’t built because of government vision. The term “government vision” is an oxymoron. 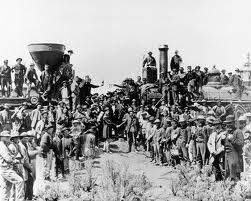 The concept of a transcontinental railroad had been proposed and pushed by private citizens and private companies for decades. It’s a little known fact of history that Abraham Lincoln represented several major railroads and those with interests in the railroads long before he ever ran for office. It’s been suggested that he was owned – lock, stock and barrel – by he railroads. He continued to represent their interests as long as he was in office. Her explanation of the virtues and benefits of abortion? Unfortunately, millions of the children were unavailable for comment. Congratulations to Debbie Wasserman-Schultz, Porker of the Month. And a bit of a pig, to boot. We are consistently amazed at the Socialists Democrats’ ability to keep straight faces as they flat out lie. And Wasserman-Schultz is one of the finest-worst. These are dark days for Democrats. Obama speaks to half-filled halls. Clinton speaks to half-asleep crowds. Former President Bill Clinton’s ‘get out the vote’ rally for Democrats at a downtown Chicago hotel was the most unenthusiastic WLS veteran political reporter Bill Cameron has ever witnessed. Clinton was an hour late for the Tuesday afternoon rally at the Palmer House and droned on for another hour, sending dozens of the few hundred Democrats in attendance for the exits. “Well, all we’re really asking for is two more years, that’s a total of four, to get us out of the hole and get us into the future. That’s half as much time as you gave them to dig the hole. Seems fair to us,” Clinton said. The state’s most popular Democrat Lisa Madigan was conspicuously absent as were state party chairman Mike Madigan and Mayor Richard Daley. Madigan and Daley were just the beginning. By the end of the speech most of the audience was also conspicuously absent. Congratulations, Democrats. Now that we’ve seen this ad, nominations for Most Offensive Ad of the Year are closed and you have officially been declared the winners. 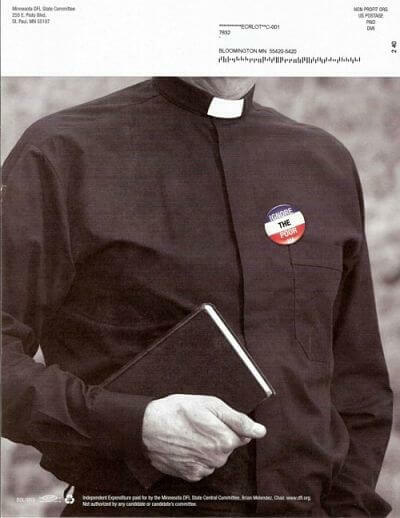 The Minnesota Democratic-Farmer-Labor Party (that’s what the Democrat Party calls itself in Minnesota) sent out this remarkably offensive “Ignore the Poor” anti-Catholic mailer. How loud would they squeal if someone – anyone – would have run an ad this offensive about Muslims?